White Wolf : The Decorah Eagles Are Back: Stand by for baby eagles on webcam! The Decorah Eagles Are Back: Stand by for baby eagles on webcam! As you may already know, the cameras that bring us all of the amazing action from the nests were damaged in storms in late June 2015 and the tree upon which the Decorah Eagle's nest (N2) sat was destroyed during a storm on July 18, 2015. None of the eagles were harmed. While eagles typically build their own nests, the Raptor Research Project took it upon themselves to rebuild the nest and assist nature, hoping that it would be adopted by Mom and Dad. Nest construction began on 8/19/15 and required assembly in place (rather than on the ground) which required the support of a ground team and a great amount of planning to execute. N2B was completed on 8/20/15 and was intended to be a starter or catalyst nest, not a finished project, the hope being that the Decorah Eagles would adopt the nest and continue to build and prepare it as nest building is an important part of bonding. The new nest is known as N2B which stands for N2Bob in order to honor Bob Anderson who has contributed so much to the Raptor Resource Project and to furthering our understanding of nature. New HD cameras were installed at both N2B and N1 in late September 2015 and much to our delight, the eagles returned and began working on the nest in early October of 2015. 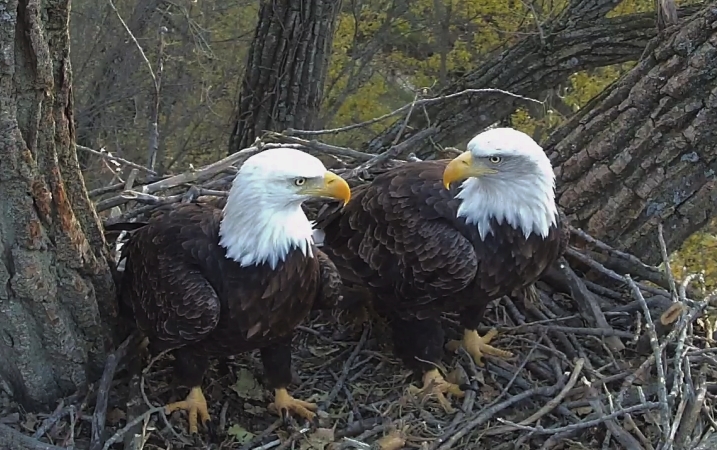 Responses to "The Decorah Eagles Are Back: Stand by for baby eagles on webcam!"